Fossils are evidence of remains of once-living plants or animals. They provide evidence of the past existence of a wide variety of life-forms, most of which have become extinct. The fossil record also provides evidence that populations have undergone change through response to changes in their environment. Students will spend a morning or afternoon as a paleontologist exploring molds, and casts and sorting fossils and finally participating in a mini-fossil Dig. Students engage in the scientific practices of collecting and analyzing biological inventory data. They analyze citizen science data to learn about terrestrial invertebrates in the various ecosystems of Camp Y-Koda. Outdoor Education field trips are offered in spring and fall to kids in Pre-Kindergarten to Grade 3. Students rotate through four activities selected by their classroom teacher. 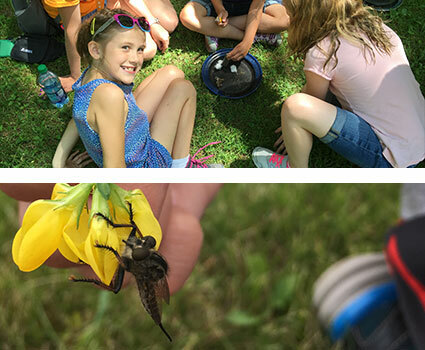 Activites include learning about frogs, garden free play, boating, nature detectives, birds of a feather, archery, water explorations, and survival skills.